EDITOR'S NOTE: There was no editor or editing. I typed this as a first draft at work and didn't check for spelling, grammar or syntax mistakes. This deck aims to be a midrange creature deck that happens to have a combo kill. Using cards like Manipulate Fate to essentially draw four cards by exiling the Griffin and Scourge, you can find your combo pieces. Once you have them and a Food Chain, you create a loop by casting and exiling one of those creatures over and over again, generating as much mana as you need. You funnel this mana into Walking Ballista and you have a kill out of nowhere. The beauty of this kill is that Food Chain itself is the only "dead" piece of the combo, with all the others providing some sort of value outside of the combo. 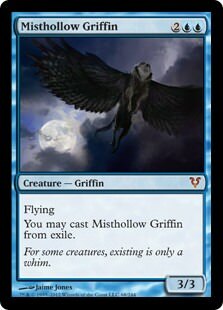 Relic of Progenitus lets you rebuy dead Griffins, and Force of Will pitching Misthollow Griffin lets the counterspell essentally be a 1-for-1. This deck is a simple beatdown deck for the most part, using Eldrazi Temple, Simian Spirit Guide and Gemstone Caverns as acceleration to create some of the best beatdown creatures printed in the post-M15 era. However, there are some cute synergies with Eternal Scourge that allow the deck to regain some of the card advantage lost with the mana acceleration. Serum Powder, assuming you don't like the other six cards it comes along with, allows you to exile a hand with Eternal Scourge and essentially "mulligan to 8" with your new hand. Additionally, Gemstone Caverns on the draw allows you to do the same thing. You exile Eternal Scourge, drop it into play, and easily have multiple mana available on the first turn to cast your creatures. Heck, with Eldrazi Temple or a Simian Spirit Guide, you can cast that Eternal Scourge you just exiled on the first turn! Turn 1: Mox, Land, Goblin Recruiter, stack your deck. Turn 2: Land, Food Chain, sacrifice Recruiter for RRR, "burn" a Goblin in hand to generate an additional R, Goblin Ringleader, draw four cards, sacrifice Goblin Ringleader for RRRRR, cast Squee, the Immortal, loop for as much red as you need, cast another Ringleader to draw four cards, play out a fistful of Goblin Warchiefs, Goblin Chieftains and Goblin Piledrivers to attack for lethal. That's a lot of things going our way, but it's pretty powerful sounding, and gives a good reason to why Goblin Recruiter is banned in every other DCI format. I don't know exactly what the maindeck for a build using the above example hand looks like yet, but it's very possible that it uses quite a few Squee, the Immortal synergies in order to maximize both the combo and the aggressive nature of a non-Food Chain hand. Goblins benefits from having multiple mana on turn one, even if it's just creating a Goblin Piledriver and passing the turn, so Gemstone Caverns may make the cut. Serum Powder allows you to exile Squee, the Immortal so that the "Useless Goblin" illustrated above is actually an exiled Squee. You can grind out a longer game by constantly casting Squee, the Immortal from the graveyard and sacrificing him to Siege-Gang Commander. Whatever the case may be, I think Squee, the Immortal is the new linchpin if Goblins wants to make its true return to Vintage. @hierarchnoble This is actually pretty interesting. For example, casting Lackey on one makes a lot of shops hands embarassing, and "I cast recruiter, my next 4 draws are Tin Street Hooligan, good luck" also seems very good against Shops. The problem is (1) resolving Food Chain and (2) having any game at all when we don't have Food Chain, as the straight Goblins Plan seems like it's unlikely to be good enough most of the time. That said...it's not like Food Chain+Recruiter+Ringleader didn't kill them before hand, on the same turn you described. We need to have a further reason to go deep here (Powder is actually a pretty good one, since we can 'find' Squee via Powder). This seems powerful to me, but I would also consider starting at something that is more a hybrid of legacy goblins (controlling creatures, tutors, mana disruption) with the potential combos available here? Are you talking about something different than the third decklist in my opening post? If so could you provide a link/list? The Eldrazi seems the most powerful to me because of its interaction with Serum Powder, Food Chain, Gemstone Caverns, and Eye of Ugin, all of which I could imagine being in the same list, but even then I'm of the mindset that Food Chain combos may just not be good enough in vintage. If Eldrazi becomes a deck in the format again (with a workshops ban most likely) I could Imagine the Serum Powder/Gemstone Caverns/Scourge becoming a real value combo for the list, something that shops cannot run, but I really don't see that food chain ads more utility to the list over playing spheres, null rods, and sol lands. Misthollow can be pitched to force and then come back which seems to make it the best option for the list, but costing more is an issue as well and has not yet had any real play in the format. Squee having goblin typing is cute, and Cavern of souls goes a long way towards keeping your combo together, but the deck just has no ability to deal with counter spells on it's food chain or moat which is still why goblins struggle to find a place in the format. 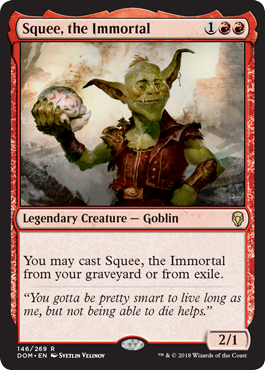 Honestly looking at him in comparison to Goblin Nabob, the original Squee is a mana free card advantage engine combined with any looting mechanism and just seems stronger overall. You're correct in that FCG, as a deck in 2005, could kill nearly exactly as my example stated, but with different cards. Considering I encountered a player on Facebook today that had "weathered years of restrictions" but listed Treasure Cruise as their first one, reintroduction to how the deck functioned seemed appropriate. Someone is born every day that hasn't seen The Simpsons. The goal is absolutely to use Squee, the Immortal as a way to make the deck stronger than it had been before. So what can Squee do that we couldn't do before? The Serum Powder trick was the one that immediately came to mind, since it both synergizes with Squee to create card advantage and treats the deck as more of a combo deck by factoring in aggressive mulliganing. The Gemstone Caverns trick was also one, since the 2005 FCG deck didn't have that extra bit of acceleration in a deck that is sorely lacking on fast mana. Siege-Gang Commander as a way to grind out an opponent by having infinite fodder wasn't as sure of a thing back then either. There may be many more examples that I haven't found yet. However, giving a deck that performed well in 2005 more consistency, speed, and ability to grind out games might just be good enough without needing any further eureka moments. As far as "Food Chain combo or bust", I don't think the Goblins beatdown plan is as poor as you make it out to be. The best deck in Vintage right now is just a beatdown deck with a bit of finesse, so why can't Goblins be similar? There's a whole lot of tinkering to be done to see if that could be the case, but I didn't go about this thread as a finished product. It's silly to have one before we even get all of Dominaria reviewed. As for the anti-Shops plan, I'd rather stack Tuktuk Scrappers instead, but I'm totally on board with your idea otherwise. I'll skip your off-topic conversation. Saying that a deck loses to counterspells is one of the simplest ways to stifle creativity rather than have a meaningful discussion about experimenting with the format. Food Chain is non-blue (Pyroblast), has CMC 3 (Mental Misstep), and is an Enchantment (Flusterstorm). The existence of Force of Will and Mana Drain, both cards that also existed in 2005, do not necessarily mean that FCG is doomed before liftoff. As for Moat, the original list contains Siege-Gang Commander, and after talking about the synergy of Siege-Gang Commander and Squee, the Immortal you can be sure that the 2018 build will run it as well. It's not even remotely correct to dismiss a card because you like a card with a similar name better. That's just foolish. One card which you haven't pointed out (which is an incidental Squee Synergy, so, there's that!) is Faithless Looting. That card seems like it does a lot for just smoothing draws, and, to boot, we can discard Squee to it so it's not just straight card disadvantage. That said, 4x Cavern of Souls does seem like a necessity--once Goblins actually gets going, it draws a lot of cards, but we need to make sure we have help getting going. I also think we want to MD a bunch of the FTK an Artifact cards. You can potentially outgrind blue, we're not actually that good at beating Sphere of Resistance once it resolves. Can we play black and Cabal Therapy/DT? Maybe some of the black Lorwyn Goblins are good enough. It seems reasonable to stretch the mana, and possible reimagine what the mana is trying to do. While I love me a mana base with five Wasteland effects, being a Wasteland deck in 2018 is much more difficult with not as much payoff. A three-color manabase with Cavern of Souls and the Strip Mine seems very doable, and all sorts of Goblins and other tools can be incorporated into an updated build. I don't know if this was deliberate, but talking about both Faithless Looting and Cabal Therapy in the same post seems like quite the synergy too. Heck, Looting discarding Squee and Therapy, casting Squee and sacrificing him to Therapy makes me feel alive just typing it out. I like everything you're saying so far, and I'm excited to solve the puzzle (with you?) once the full spoiler goes live. @hierarchnoble I didn't say that the deck would be impossible to play, just that it was disadvantaged. Let's look at it this way. Because of how the deck actually plays, once your engine starts you know you cannot draw counter magic or enchantment removal because all you can draw/play are goblins and all you'll have mana for are goblin spells unless you search out prospector in which case you'll maybe have red mana. To my knowledge there is no goblin counterspell. So you can run 4 REB, 4 Pyroblast, and 4 Mental misstep to try to fight back against counter magic. Those basically have to be in your opener to come up and you have to remove something from the maindeck to make room, I am uncertain what. Since the decks search cards cannot search for Food chain, you also probably want that in your opener as well. Meaning I am guessing the deck also mulligans poorly. Assuming you go that route, you are still dead in the water against a abrupt decay against your food chain. I am not even sure there is an answer for that. So like I said, the deck is playable in that it has a consistent internal logic and can win games. I think it is a poor choice because it comes up short against some of the most common cards in the format that almost outright stop the list cold. So what you're saying is sideboard Defense Grid? Has the same issue as all the other cards though, you need it in your opener because once the engine goes you cannot draw it. Additionally, does this deck not just collapse under one sphere? A single sphere stops food chain from netting you mana. You can get around that a little bit with warchief if you already have food chain on the table, but otherwise you have to draw into artifact removal, none of which you are running mainboard. So just to reiterate, your deck is soft to and does not have maindeck answers against Sphere Effects, Counter magic, and abrupt decay and other enchantment removal spells. I think you can probably assume you will see those thing in your average vintage event. All of your posts place too high of an importance on Food Chain, too low of faith on aggro being a viable Vintage strategy, and assume the opponent "always has it". By developing a deck that is able to pivot its plan based on the opening plays by our opponent, we can create a deck that isn't dependent on just the combo finish that was illustrated in the opening post. Just as Doomsday was able to create piles based on the winning line, so can Goblin Recruiter. Goblin Recruiter doesn't lock you in to stacking the entire deck, and having a Goblin Matron in a pile can allow you set up in such a way that you can pivot when Food Chain doesn't resolve. Incorporating some of the ideas that @neo_altoid presented can create even more chances to leverage playskill. @hierarchnoble I get it, I mean I play Living end in modern and combo infect in legacy. Both these decks have a combo win but also a backup plan where they can just go face with dorks as needed, since at the end of the day the deck are creature based. The difference to me though is that the power level in those formats and with those cards is such that it affords you more opportunity to run the backup plan, and the counters to the combo are not commonly maindeck cards. When Living end gets turned off in rounds 2 and 3 because your opponent sided in grave hate, you still have what amounts to a 3 mana wrath of god. When infect cannot combo you still have a deck full of evasive creatures that do unhealable damage and get in effect double power from pumps. Goblins in vintage for the most part gets you a bunch of underpowered goblins that afford you no disruption to your opponents potential combo kills. It just does not seem well suited. You are correct in that it does not make sense to explain an untiered Vintage Aggro-Combo deck to someone who plays an untiered Aggro-Combo deck in both Legacy and Modern. I will refrain from discussing those formats. What I would like to say is that you continue to present the "always had it" mentality from your prior posts. If I present a plan for how to win against Force of Will, you'd point out that it's soft to Abrupt Decay. If I include that, you'll cry foul that we're soft to Workshops. If I include a card that blows up Sphere of Resistance, you'll point out how we're already dead to Yawgmoth's Bargain before we can cast it. FCG is not seeking to be 60/40 against the field, and there will be bad matchups no matter what. I don't know what you play in Vintage currently, but I'm sure it's soft to something too. When it comes time to design the 60 and the 75, we will pick and choose what makes sense and make adjustments as the metagame evolves. Have you considered chrome mox? Imprint squeeze early for acceleration, cast him late when comboing. Alot of the goblins need multiple red so I can see it being a nice supplement to a ruby. I think gemstone caverns is not a vintage card because of wasteland. My opponent puts caverns into play turn 0 I am wastelanding it to 2 for 1 my opponent. I feel the issue with Squee is that the CMC is too much. It needed to be 1R. The double red is almost not vintage playable because of that. It's hard to think of double RR Vintage cards. Pulverize comes to mind. I give you credit though for trying to think outside the box. @ssasala That, I think, is the real issue. The cards are probably just barely too inefficient to really be competitive. Really--I think the deck has two things going for it. First, you can almost certainly beat shops if you want to, since you can play a gazillion ETB kill an artifact creatures, and your aggro plan isn't that bad (though Ballista makes life harder). You've got cost reducers to fight through Sphere, and cards that make many shops draws look positively embarrassing. Second, the goblins engine is pretty dumb in the number of cards it assembles (just in raw quantity). Better still, your engine isn't just spinning its wheels, it's also getting them dead. You've got a real shot against fair blue, as you're not really all that harmed by Force of Will (most of your cards are just goblins!). Yes, we're going to get roflstomped by the unfair blue hands, but we're not just dead to the volume of cards from Ancestral if we're caverning down Ringleadeader et. al. Our problem is that the aggro plan is the worst of all viable aggro plans, and our combo plan is likely necessary, but quite fair all things considered. It can and does fall apart to a lot of things, and it's only barely a legacy strength plan (and the legacy deck relies on Vial+mana denial). Sure, there are truly busted and unbeatable starts (Lotus, Mountain, Warchief, Piledriver x2, they're dead), but you need more going for you than other decks, and you're subject to the whims of your opener. If black is included in lists it gives you access to Demonic Tutor, Vampiric Tutor and Cabal Therapy. Also, Pyrokenesis is an option, exiling Squee to take out an army of MUD dudes, or a handful or Tokens/Snappys/Pyros/Bobs/Vryns etc etc.